YMT is a national music theatre company who offers training for talented young actors, singers, musicians, dancers and theatre technicians aged between 11 and 21 years old. Soul Music forms part of the Death Trilogy, continuing the theme from YMT’s performance in 2012 of Mort: The Musical. Having grown up reading Terry Pratchett’s books, I was looking forward to see what YMT had produced. Especially since the Director was Luke Sheppard, who has also worked on high-profile shows such as Matilda (West End, Broadway and RSC) and Into The Woods (Regent’s Park Open Air Theatre). The show centres around Imp Y Celyn, a harpist who is looking for a new sound to make his band more captivating. He comes across a magical guitar that harnesses dangerously addictive music. Along with an ensemble of wannabe rock stars, Imp attempts to control the hypnotic new movement, which has disastrous consequences. Act One started strong with a great introduction to the story, that was not only easy to follow but also enthralling to watch. Joe Bence was fantastic as Imp and really shined with his acting ability, whilst the characters Quoth and Death of Rats brought a light element to the act with funny one-liners. Grace Mouat was definitely a stand out performer too, with a fantastic singing voice. She played the character Susan who has the ability to fade from other people’s consciousness – all except from Imp’s. The pair instantly become friends, however their friendship is rocked when the character Death (the grandfather of Susan which is only revealed later in the plot) decides to abandon his post and Susan is forced to take on his duties. My highlight would have to be the last number of the act, where Imp and his band give their first performance using their new sound. A thrilling piece! This set the scene for Act Two where all chaos ensues. I particularly liked the use of contact lenses for Imp, which showed his transformation from being a normal teenager to being possessed and controlled by the music. Although it created a dramatic change, it was a nice touch from the costume designer. 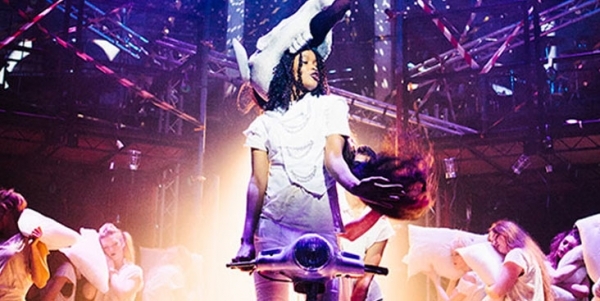 The musical numbers, composed and directed by Whatsonstage.com nominee Craig Adams, were electrifying and flowed well with the mood of the story, and I thought the performers were well-choreographed by Cressida Carré. The set design truly brought the story alive. The use of metal fencing and wooden cargo boxes gave it a real urban feel, and the lighting was particularly effective during dramatic scenes, for example when Imp first finds the guitar. YMT has a number of upcoming national auditions for its 2015 Summer Season of New Music Theatre coming up. For more information check out its website, here. A special thanks to YMT for inviting us to your show – we had a fantastic time! The summer productions are now finished, but we definitely recommend looking out for next year’s programme of shows. We sure will be!